Return your vehicle to pre-accident condition in a short time with collision repair services and auto painting at Felix's Autobody & Frame Repair, Inc. Our shop works with all insurance companies in the industry, so stop by for a free estimate.Towing and rentals available .No appointments are necessary. 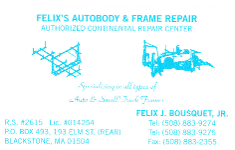 In business since 1985, Felix's Autobody & Frame Repair, Inc. is an autobody shop in Blackstone, Massachusetts, going above and beyond what customers expect. You can always count on our family-owned-and-operated business for 100% guaranteed workmanship, competitive prices, and extraordinary customer service. We take pride in our work, and customers love the end result. Additionally, Felix, the owner, personally meets everyone. Contact us at (888) 971-9632 to discuss fixing your damaged car correctly and quickly.